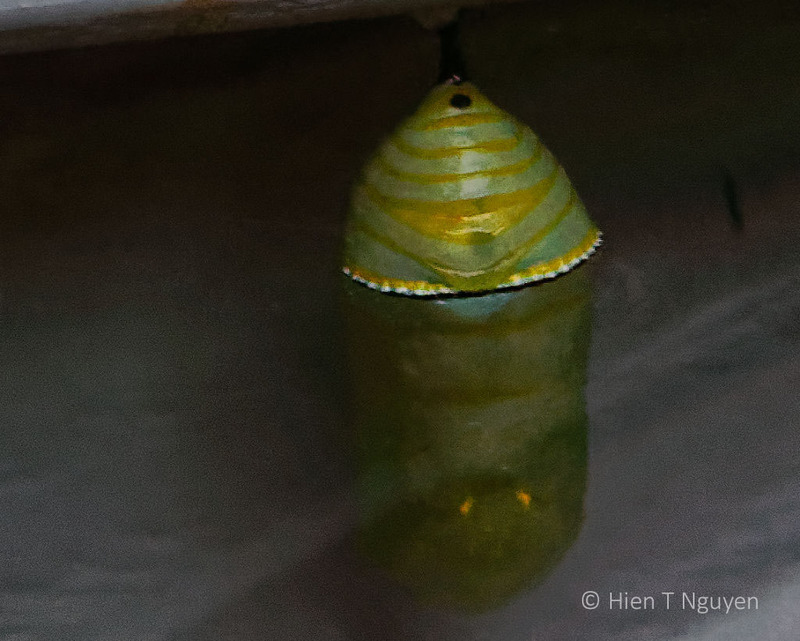 This is what the Monarch chrysalis looked like on 20-Sep-2018. Three days ago, the butterfly was visible inside. Yesterday, I saw no change and did not take a picture. Today I was out of town for most of the day. 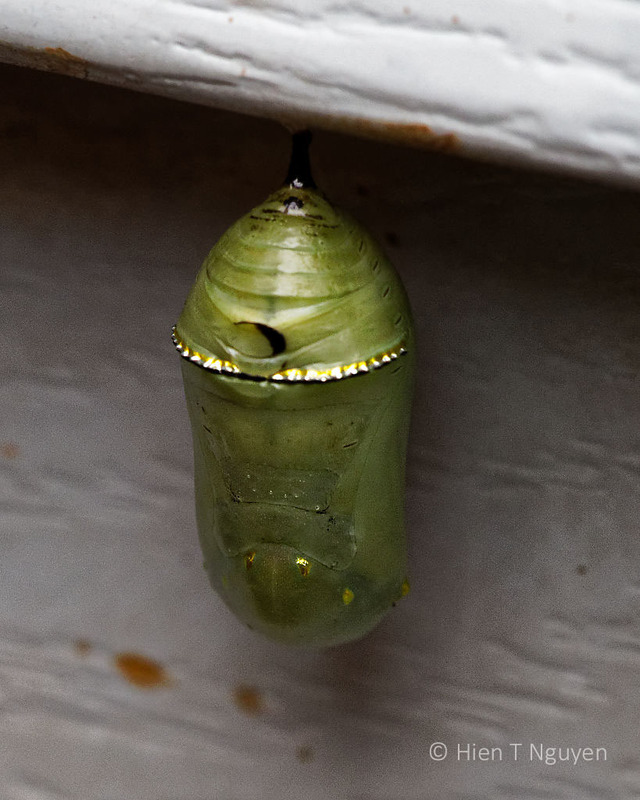 When I came back in late afternoon, the chrysalis was empty! I removed the empty and dry cover from the underside of our house siding, laid it on a table and took the following pictures. So, in this case, it took a total of 17 days before the Monarch butterfly emerged, and not 10 to 14 days as written on several Web sites about Monarch butterflies. I am disappointed to have missed the emergence of the butterfly, but I am happy that it did finally emerge, and may be on its Southern migration soon, if not already. 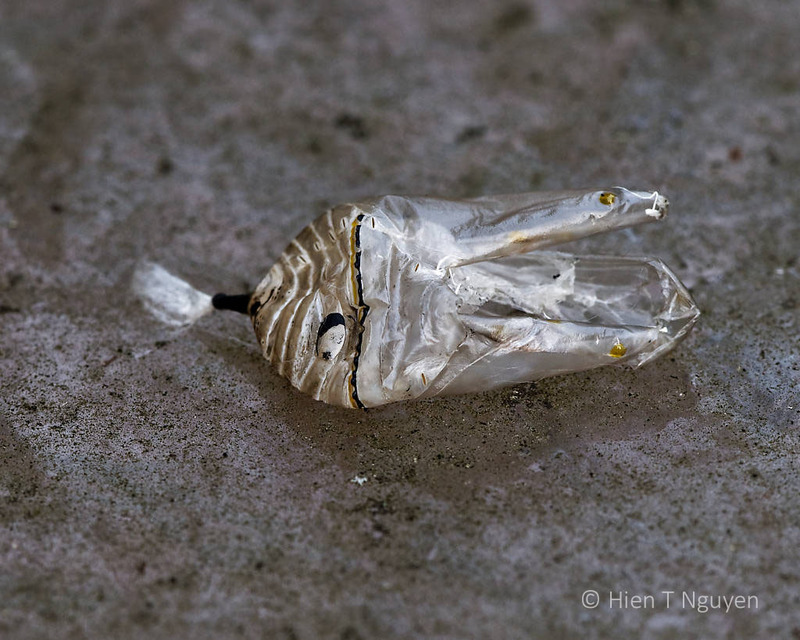 Here’s a photo of a Monarch butterfly, but it’s not the one from the above chrysalis. This is so awesome…my last few blogs has been on the Caterpillar, as I watched it on the milk weed this summer, unfortunately I didn’t get to see the next stage as you did….so very beautiful and congratulations…God willing I’ll be checking for it again next year. I was looking high up, but look like yours was in the pupa pretty low down. The pupa was at the bottom of our house siding. Next year, I’ll be better prepared. Thank you for visiting and commenting! A nice ending after all … shame that you missed its entrance, bet you were disappointed.. Overall though, I am relieved that the butterfly emerged. Thanks Julie! Very interesting indeed! I am sorry you missed the big occasion, but happy it came out and is happily flying around somewhere, probably not very far from you. This is the 4th generation of Monarchs for the year and, according to those who should know, it should be migrating to Mexico. Perhaps next year I will see its children come back to our area. Thanks Hien for sharing the series with us! Glad to know that the butterfly did emerge eventually – perhaps the cooling seasons had an impact on the extended duration of the metamorphosis? The miracle of life 🙂 Beautiful pics! 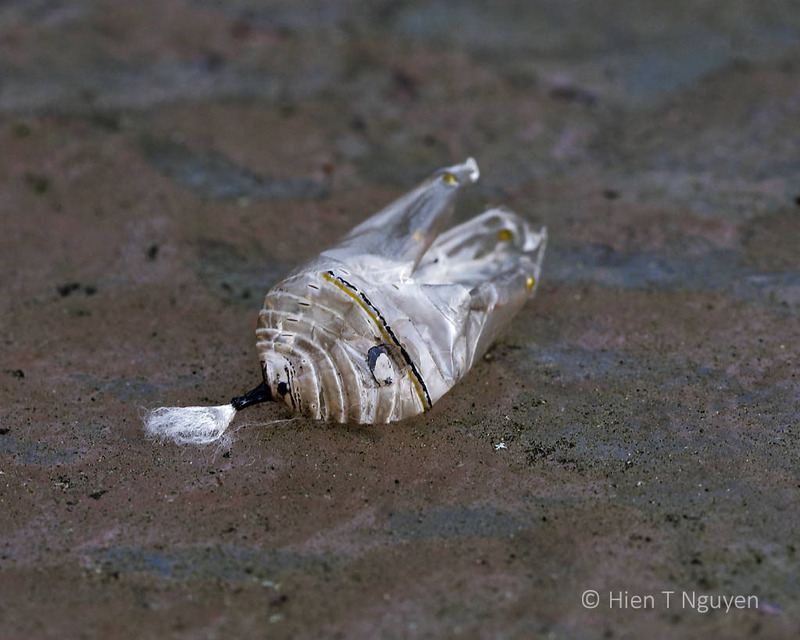 Such a poignant story, and a surprising conclusion to the tale of the chrysalis. 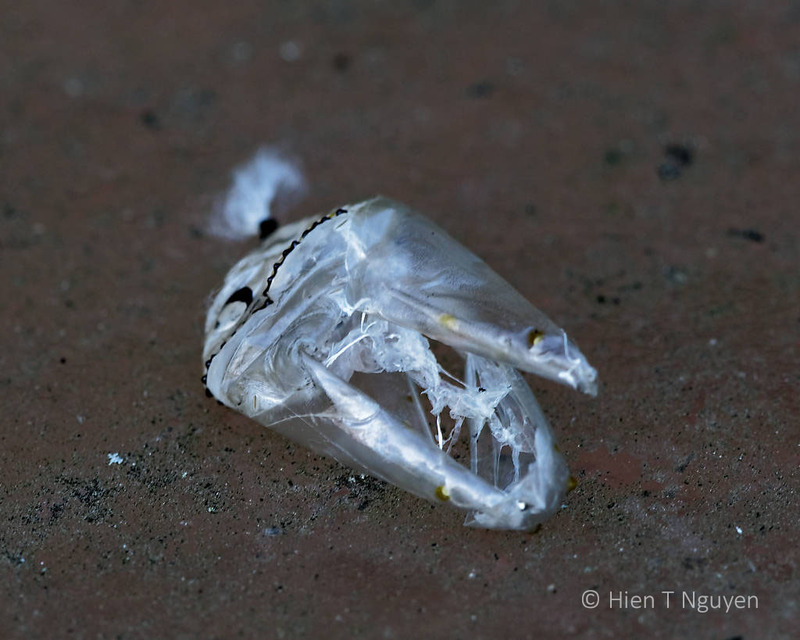 I’m sorry you weren’t there for the emergence too, but I like the way you presented this, with photos of the emptied chrysalis and the promise that the butterfly is surely on its way south. Thank you Lynn! 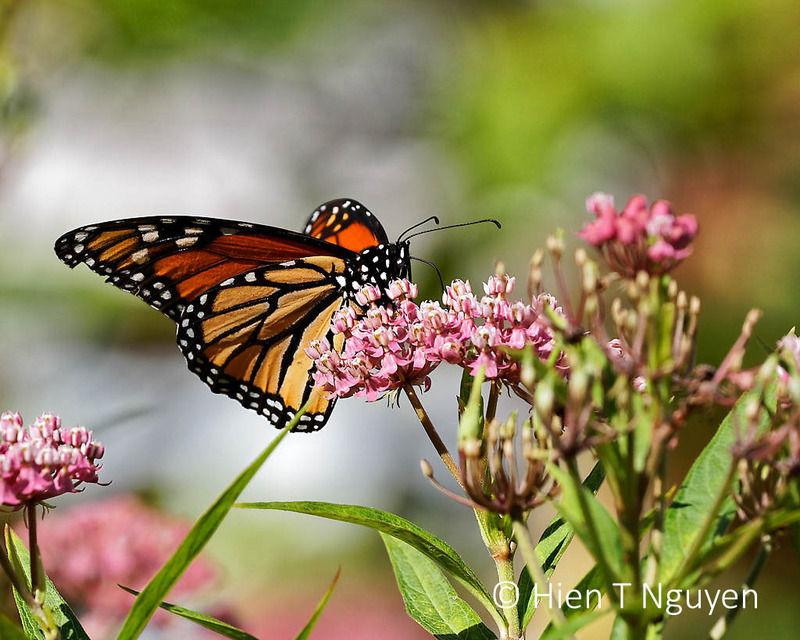 There is always next year, and by then I will have more orange milkweed, the kind the Monarchs really like. Great, let’s hope it will be a good year for Monarchs. Oh wow this series of photographs is awesome! What a shame however, that you missed the emergence of the Monarch Butterfly. So many people have taken an interest in the Monarch Butterfly and doing exactly what you are. I myself have plenty of milkweed on my wild part if our property and I have a huge butterfly bush in my Gardens strictly for the butterflies. With all of our efforts combined, they are slowly coming back and number! How exciting! Thank you Amy! I am really happy that you are doing more than your share for the Monarchs. I’m sorry that you weren’t able to see the butterfly emerging, but at least the butterfly did survive. I thought that 10 to 14 days sounded too quick for the transformation to take place, but it’s been many years since my childhood when I studied monarchs as much as I could at the time. Thanks Jerry! I will try again next year, and will have to remember to never give up on these butterflies. Well, there was always a possibility that would happen, sorry you missed it. You are right. The possibility of missing its emergence was on my mind the last few days. My sentiments exactly! I can always try it again next year, but it is a good feeling to know this first one emerged and flew away fine. I pray that this Monarch butterfly will have a happy life. And, there is something to look forward to for the next season! Sorry you missed it, but glad you had a successful launch. May it safely reach its wintering grounds! Yes, may it reach where Monarch butterflies go to give us such a grand spectacle when they come back up next year! Wonderful photos. So glad you got to watch that process. Wow what a cool looking series. Great series!! Beautiful!